They are elastic at low temperatures and withstand high point loads. 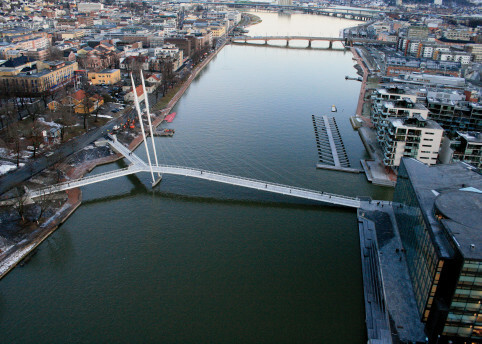 Therefor, Elmico’s thermosetting plastic solutions are extremely suitable as primers, membranes, and coatings for bridges, roads, and quays in a Nordic climate. Elmico’s primers and membranes protect against leaks and blistering, extending the life of bridges and roads. Along the Botnia Railway, the largest rail development in medern Sweden, bridges are waterproofed with Elmico products to prevent salt and water penetration, corrosion, and disintegration. Norwegian roads include a protective layer under the asphalt on wooden and concrete bridges. Other important applications are quay facilities, drainage conduits, tunnels, and roofs. Elmico has solutions that can be applied at low temperatures and still retain their properties, even in extreme cold. Application is quick and the plastic sets rapidly. Elmico focuses on application-friendly products that are easy to handle. We cooperate with equipment suppliers om product development for thermosetting plastic and spray equipment. We work closely together with contractors to ensure an optimum end result. Elmico products were used to protect the concrete anchorages securing the cables from water absorbtion and decomposition.